Since 2016, Boston Pride has disbursed over $50,000 to 35 grassroots organizations in our community. Applications may be submitted online until December 15th: click here to submit your application now. For questions and comments, please contact Linda DeMarco at [email protected]. With the additional contributions our community members have given at our JP and Back Bay Block Parties, and with the proceeds from the High Heel Dash, we have established the Boston Pride Community Fund. Once a year, in support of our vision and mission, we will give back monies raised in our Community Fund to non-profit organizations and groups within our community. Recipients will be announced in the month of January 2018. Awards will be disbursed by February 15, 2018. Projects submitted for funding through the Boston Pride Community Fund shall be conducted in the 2018 calendar year. Recipients shall submit a written report about the use of the funds by 10/01/2018. Failure to submit a report will bar applicants from further eligibility to the Boston Pride Community Fund. 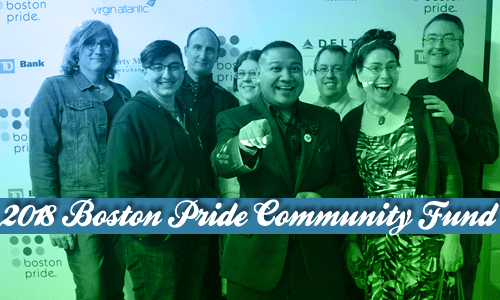 Recipients will be invited to the Boston Pride Open House to report on their project in the Spring of 2018.